eBay For the Greatest Performance and Value You'll Find in a Golf Glove, Try the MG Golf DynaGrip® All-Cabretta Leather Glove! First-quality only, no seconds! The MG Golf DynaGrip Glove Features: All-Cabretta Leather Quality and traditional styling comparable to FootJoy Sta-Sof® Winner on the PGA Tour All-time best-seller—well over 10 million sold! 60-day money-back satisfaction guarantee. Available in white, 11 different sizes and right- and left-handed. (This listing is for Cadet gloves, which have 1/4" shorter fingers than a men's regular, and a slightly wider palm. See other listing for men's regular) The hand-hugging fit, traditional looks, buttery-soft feel, and long-lasting durability of our DynaGrip golf glove all add up to the great performance. It has been worn by the winner of several PGA Tour events. Put DynaGrip next to other famous brand name gloves (like the FootJoy® Sta-Sof® glove), and immediately you'll see and feel the features that make DynaGrip a superior glove for golfers of all abilities. For instance, we use only premium-quality imported Cabretta leather skins. These skins are buttery soft, yet extremely durable. Our exclusive Medan tanning process enables our gloves to resist moisture and perspiration, and to provide a tacky connection between your hands and the club. You'll be able to use less grip pressure for better golf shots and your glove will last longer. Only the best golf gloves use Cabretta leather because of its softness and durability. Moreover, our entire DynaGrip glove is made of Cabretta leather. Compare that to many brand-name gloves which have become part synthetic and only part Cabretta. Quality Details The more you wear your MG Golf glove, the more you'll appreciate the quality features that go into it. You'll notice the thin, but durable edge trim that prevents the edge of the leather from fraying, even after many rounds of use. The detailed stitching gives your glove a tailored appearance. But it also provides extra strength at critical points where stress makes other lesser quality gloves simply fall apart. Our DynaGrip glove offers tour-quality performance and feel. 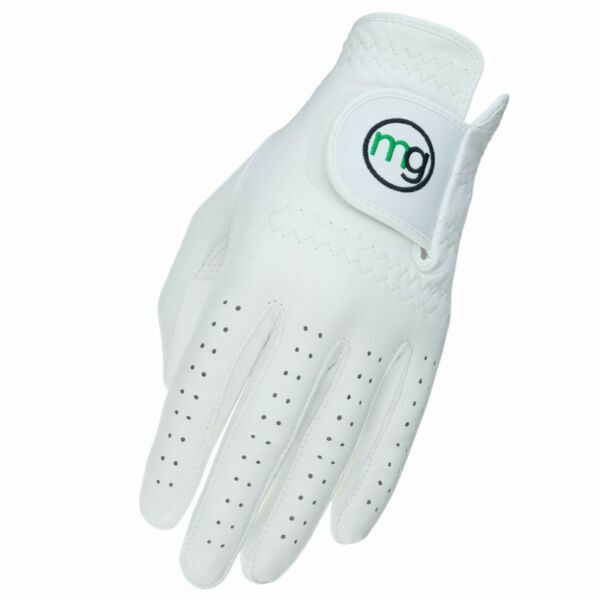 What Our Customers Say "I have been using MG Golf gloves for years ... I would not use another glove because for wear, comfort, and fit I have found MG Golf to be the best! "—Ronald J. Pape, Waukesha, WI "I share your gloves with my golf buddies so they can see that there is an alternative to the high-priced gloves found in pro-shops and golf specialty stores. Thank you very much for a great golf glove. "—Michael Kinzer (Hdcp. 4.7), Boise, ID Don't Wear a Glove? If you don't currently wear a golf glove, you owe it to yourself to try one. You get a distinct advantage by being able to take a secure grip of the club without excessive grip pressure. Too much pressure adds tension to your swing muscles, reducing clubhead speed and preventing a proper release through the ball, often resulting in a slice and lost yards. But the tackiness of our all-Cabretta-leather DynaGrip glove gives you a secure, connected grip even while your hands remain relaxed. That allows you to strike the ball more squarely and with greater swing speed for more accurate and longer golf shots.With that kind of advantage, is it any wonder that over 95% of Tour pros wear a golf glove? Unbeatable Selection MG Golf offers selections that no pro shop or golf discount store can match. On any given day we have tens of thousands of gloves in stock, ready to ship immediately. You get a choice of 11 hand-hugging sizes, right- or left-handed, in classic white leather. (This listing is for Cadet gloves, which have 1/4" shorter fingers and a wider palm. See other listing for regular).) Great Value! Our #1 competitor is FootJoy®'s famous Sta-Sof® glove. While it has many of the same features you'll find in our DynaGrip glove, it sells for $19.99 — even at golf discount stores. With this special eBay offer, you can get our best-selling DynaGrip All-Cabretta Leather Glove for much, much less. How can we undercut one of the biggest companies in golf by so much? 1) Volume. Over two million golfers wear gloves from MG Golf! 2) We sell direct to golfers, not through retailers or pro shops, so no middlemen markups. 3) We don't pay for Tour pro sponsors or expensive TV ads. Put them all together and you have a pro-quality product at a bargain price!